New Front and Rear Extreme Duty Jeep JL Wrangler Non Rubicon 1310 Series CV Driveshafts with Solid U-joints. Custom made by Adams Driveshaft. This Extreme Duty Series Solid 1310 CV Driveshaft will work up to 37" Tall Tires after that size we Recommend you upgrading to our [Extreme Duty 1350 Solid Series]. Bigger tires adds more Weight, Traction, and more Pressure on your Drivetrain Components like your Driveshafts, Axles, Gears, Etc so you want to make sure you are buying the right driveshaft for your Jeep. This Driveshaft will work up toa 6" Lift after that the angle may be too Severe or Bind. Please enter your Measurements, Year, Make, Model, and Lift Size in the notes when you check out, e-mail us, or call us at 702-568-5680 between the hours of 8:00 am to 5:00 pm Pacific time Monday thru Friday after you have purchased the Item. The pictures below show you how to measure if you still have Factory yokes. There is a Measurement Chart below showing you how we would like you to measure with the jeep sitting at Ride Height. Has a Heavy Duty Flange on it that fits your OEM Front Pinion Flange so it is Easier to install so no need to Disturb the Crush Sleeve. Has Long Full Spline Slip n Stub unlike our Competitors. Use the Strongest Non Greasable U-joints on the Market. Contains Grade 10 CV Bolts with small heads on them so they are easier to install and a Packet of Loctite. Made out of 2 1/2" X .095 Wall D.O.M. tubing that is Double the Strength of the Factory Tubing. Others use 2 1/2" x .083. Has Long Slip n Stub unlike our Competitors. 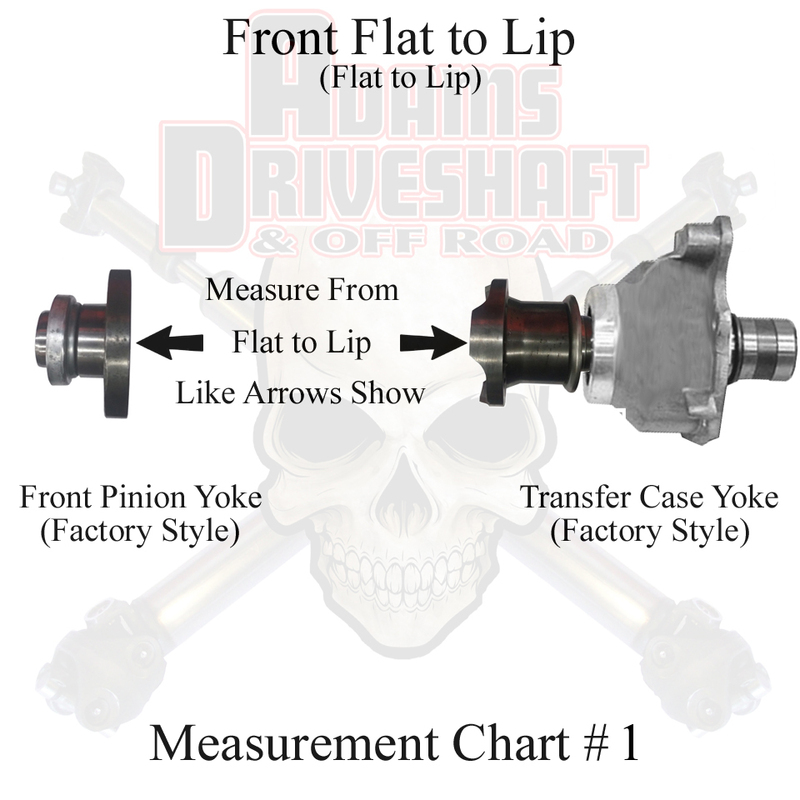 American Made Rear 1310 Transfer Case Output Shaft Yoke. Contains Grade 10 Bolts with small heads on them so they are easier to install and Loctite. This Item will include the following parts. 2" X .120 Wall Extreme Duty 1310 CV Driveshaft with Spicer Solid Non Greasable U-joints, with a OEM Flange. Lifetime Warranty if you twist our Tube, Break a Weld, or Break a U-joint in Half due to Torque. 2 1/2" X .095 Wall Extreme Duty 1310 CV Driveshaft with Spicer Solid U-joints. Lifetime Warranty if you twist our Tube, Break a Weld, or Break a U-joint in Half due to Torque. Set of  Grade 10 Bolts for the Rear Oem Pinion Flange. WE WILL NEED MEASUREMENTS LIKE THE PICTURE BELOW SHOWS WITH THE JEEP SITTING AT RIDE HEIGHT. Click the button below to add the ADAMS DRIVESHAFT JL FRONT & REAR 1310 CV DRIVESHAFT PACKAGE with SOLID U-joints [EXTREME DUTY SERIES] to your wish list.